To make that perfect cup of tea, you'll want a kettle that heats water up to the ideal temperature. While you can find electric kettles, or you could boil water in a pan, it is a traditional stove top kettle that tends to deliver the best results. 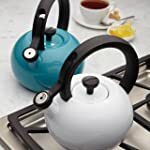 Read on to find the best tea kettle for a gas stove and check out reviews of some of the top tea kettles on the market. To Whistle Or Not To Whistle? 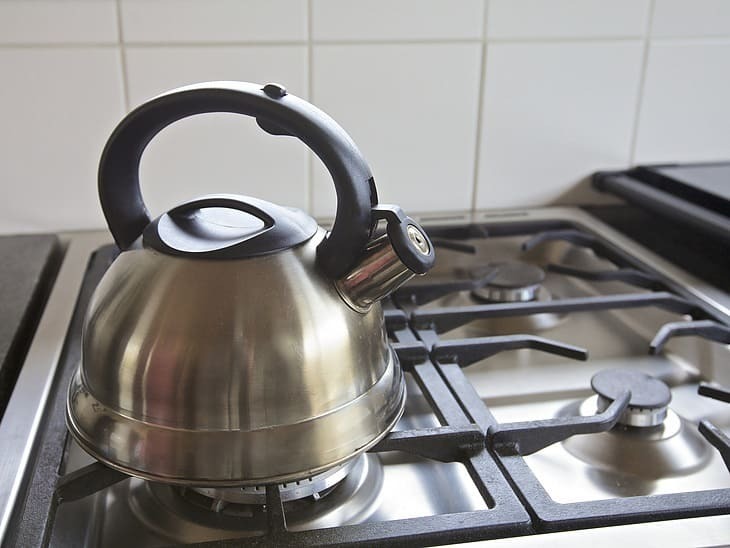 Do You Need a Kettle for Your Gas Stove? Tea is more than just a drink in many countries; it is a ritual. In Japan, the tea ceremony is an important part of the culture, and in England it is a social custom suitable for breakfast, after dinner, or when visiting friends. If you enjoy tea on a regular basis for its warmth, flavor, or health benefits, a tea kettle provides a great way to boil water faster and with less mess. 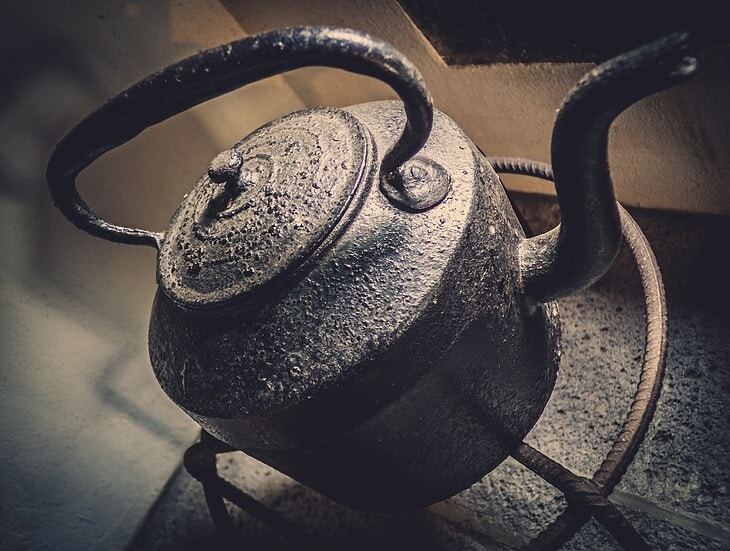 Many tea kettles for stove tops are made from a metal that conducts heat well, which means the water boils faster. You'll get your hot cup of tea in less time, and you won't have to rewash a pot every time it is used. Plus, there is a special aesthetic value to a tea kettle, and you can find one that matches your personal style or the design of your kitchen. One of the trademark characteristics of a tea kettle is the whistle. If you're like many people around the world, you might associate that whistling sound with the comfort of a cup of tea. The whistling sound is made when steam builds up in the kettle, and it is a notification of sorts that the water has boiled. However, you aren't obligated to purchase a tea kettle that whistles. You can opt for one that doesn't ever whistle, or you can get one with a spout that tilts up and won't whistle when manually adjusted. The choice is yours, but keep in mind that the whistling is also a great reminder that the bottom of the kettle will boil dry soon, so keeping the whistle can be practical as well as nostalgic. Tea kettles for gas stoves come in a range of different materials. 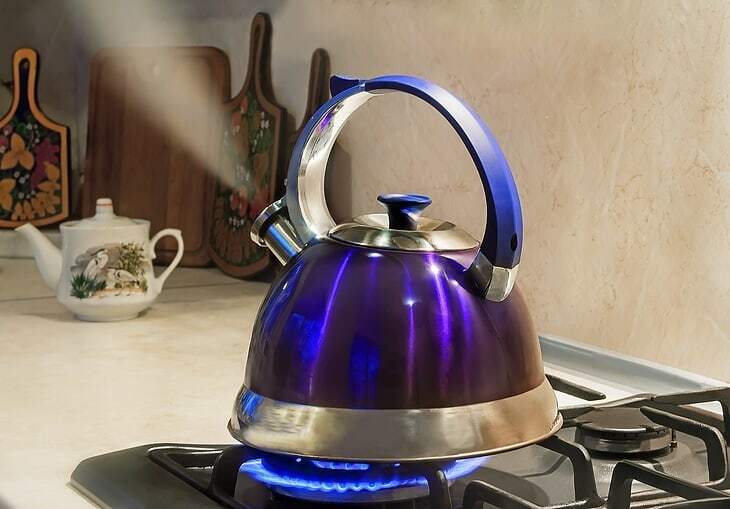 Aluminum tea kettles are popular because they are lightweight, they are energy-efficient, and they tend to last a long time without scratching or breaking. 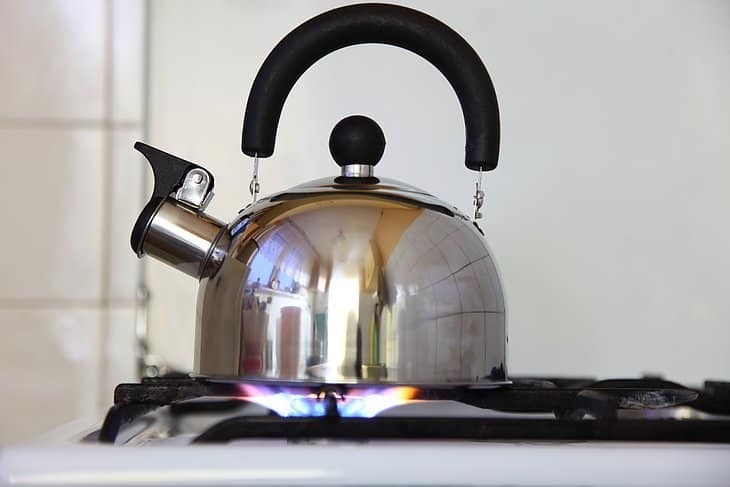 Stainless steel tea kettles are also very common and inexpensive, but you'll need to use a pot holder to handle the kettle when it's hot or invest in one with a rubber handle. 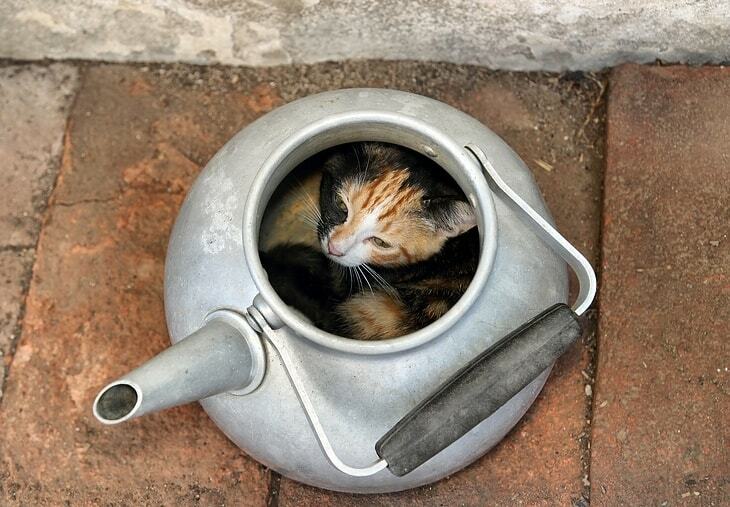 Copper tea kettles heat water very quickly, but they require regular maintenance in order to prevent tarnishing. Glass tea kettles look sleek, but they are fragile and typically have a short lifespan. Cast iron tea kettles are very durable, but they are also heavy. Many cast iron tea kettles are coated in enamel to make them easier to clean and more visually appealing. Along with the more practical side of tea kettle ownership, which might include thinking about heat transfer and maintenance, buying a tea kettle can also be a way to express your personal style. A cast iron tea kettle covered in enamel, for instance, comes in a wide range of bright colors and even unexpected patterns. A simple glass kettle, on the other hand, may be a contemporary or sophisticated addition to an elegant kitchen. If you're decorating with an industrial aesthetic in mind, an aluminum or copper kettle could give off the right edginess. Choose a color, design, and material that represents your style and the vibe of your kitchen space. Whether you drink tea, instant coffee, or just a mug of hot water with lemon, a tea kettle is the obvious way to heat up water quickly. However, there may be some controversy about whether a tea kettle for a gas stove is truly necessary. Electric kettles, which get plugged right into an electrical outlet, are often faster and more efficient appliances. However, a tea kettle on a gas stove can operate even when the power goes out! Imagine a cold winter day without power, and you'll start to appreciate the value of a traditional tea kettle that works on a gas stove. There's also that traditional appeal of the old-fashioned look of a classic tea kettle, which brings charm and cheer into an otherwise ordinary day, particularly if you grew up using a tea kettle on a regular basis. Le Creuset is a name synonymous with high-quality kitchen gear, so I had high expectations for this tea kettle. At first glance, you can see this is a Le Creuset product because it comes in the same ombre green colors as other products in the line. If you're a Le Creuset collector, you'll appreciate that the kettle fits right in and is so easily recognizable. Beyond looks alone, the tea kettle boasts locking handles, which I appreciate when the kettle is full and heavy. You can also quickly flip the whistle spout to avoid the whistling sound if you don't want to hear it, and when it is on, it sticks to a single, pleasant pitch upon hitting a rolling boil. 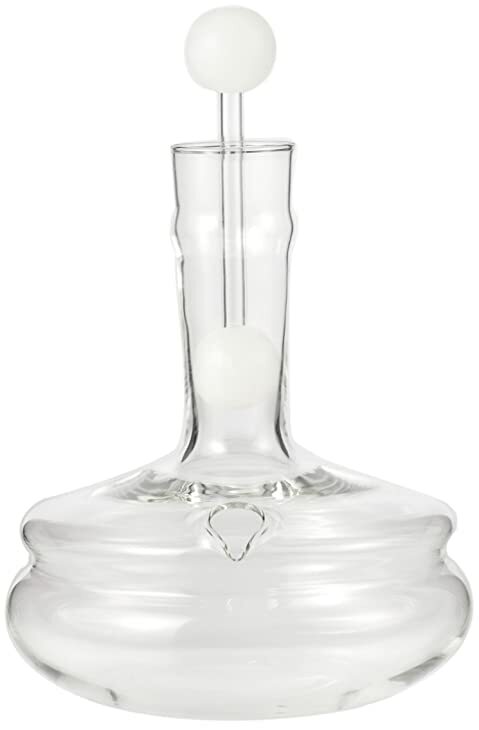 The Chemex glass kettle looks a little bit like something that you might find in a science laboratory, and that is all part of the appeal. The design is completely modern, but it actually dates back to 1949 and was once featured in the Museum of Modern Art. The tea kettle has a round, wide base, which means that it has a bigger surface area to heat up the water, and then it tapers to a thinner neck for holding and pouring. As a bit of a clean freak, I appreciate that you can instantly tell whether or not the kettle is clean. Since it is made of glass, you can spot any marks or impurities right away. If you're looking for a classic tea kettle that is suitable for hosting a formal high tea, then a stainless steel tea kettle like this one may be ideal. Perfectly polished with a beautiful mirror finish, this is what you might expect to have on hand when you're entertaining clients or special guests. I wish I'd had this kind of kettle when I was meeting my in-laws for the first time and trying to make a great impression! 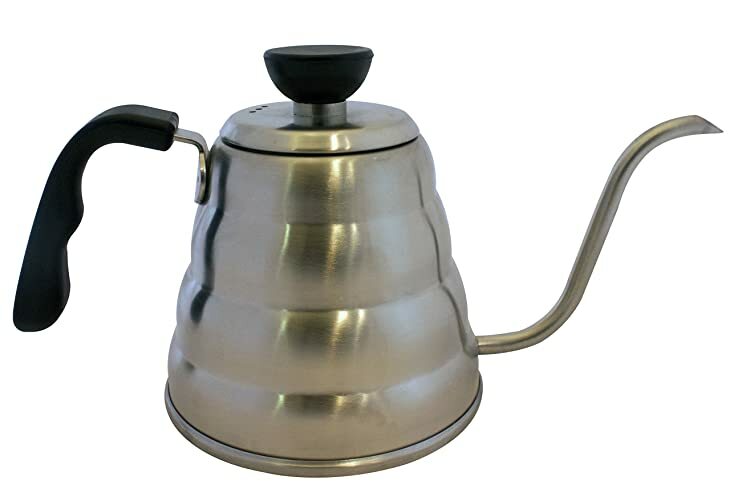 The rubber-coated handle makes it easy to lift even after being on the burner for a while, and there is even a rubber addition on the spout and the lid so you'll never have to worry about burning your fingers. Right away, the MIRA Pour Over Kettle impressed me with its unusual design. The beehive construction gives it a definite hipster feel, and the goose-beck spout is unexpected and makes it easy to pour hot water without spilling a drop. This is not just a kettle for making tea, and it is easy to see how it could also become a favorite for someone who enjoys a pour-over coffee in the morning. If you're worried about switching back and forth from a gas stove to an induction cooktop, you'll be pleased to learn that there is an induction bottom that makes the kettle completely versatile. This is a fantastic kettle for a single person or perhaps a couple, but the smaller size means it isn't quite right for larger events. The first thing you'll notice about the Circulon 2-Quart Circles Teakettle is how gorgeous the colors are. Although it comes in a plain stainless steel, the turquoise and kiwi green shades are fun and definitely a little retro. This is fantastic if you've got a little love for anything vintage or mid-century modern! The tea kettle is lightweight at just over three pounds, but it still holds 8 cups of water if you want to make hot beverages for a crowd. One drawback to this stylish tea kettle is that the small lid and top opening make it a challenge to clean. I couldn't stick my hand into the tea kettle, and instead relied on a dishwashing brush, so this could certainly make it tougher to keep clean over the long term. Out of these five tea kettles, the clear winner is the Le Creuset enamel-on-steel demi teakettle. It comes with a whistling function, but the spout can easily be lifted to eliminate the sounds if you'd prefer some peace and quiet. 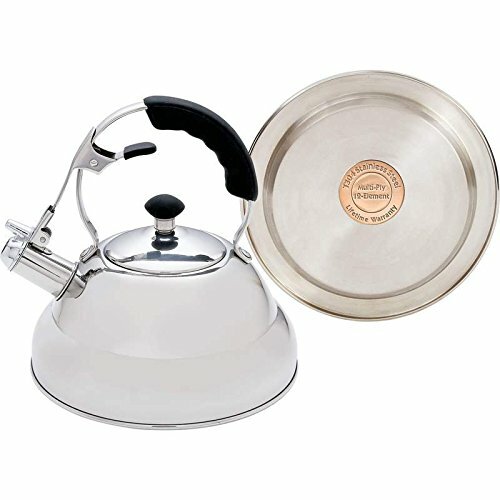 The tea kettle also happens to be made from a durable steel material, but its enamel coating makes it easy to clean. Since it holds 1.25 quarts, it is large enough to make several cups of tea without being too heavy or bulky. Perhaps best of all, the Le Creuset enamel-on-steel whistling kettle comes in a beautiful and distinct color, which matches the other products in the kitchen line for a cohesive, stylish look in the kitchen. Did you find this helpful? Let me know in the comments and share with someone you know! the bottom is stamped “Maibach” Can you help us? I can send you pics if I have an email.